The All Saints Chorus and Orchestra was formed in 1994, and is a community choir. Membership is open to all and there are no auditions. We have a reputation for performing concerts of the highest standard in Newham, the area in which we rehearse and perform. We are a charity, registered number 1111845. Our repertoire of music is extensive, ranging from the 15th century to the current day. Included are the great works of many major composers. The chorus enjoys a good social life outside the rehearsal room and our annual weekend away provides the perfect opportunity to rehearse, socialize and relax. The All Saints Orchestra is a mix of seasoned professional players featuring instrumentalists from many of the major London orchestras. 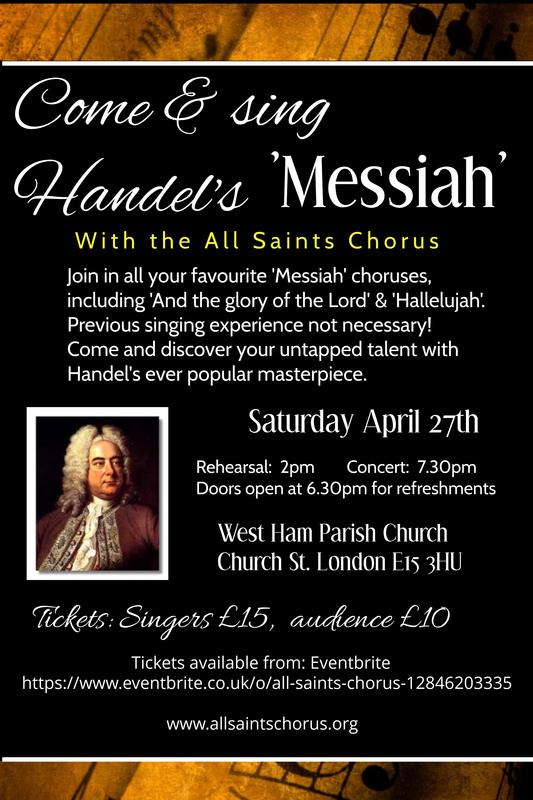 Together with the Chorus and our dedicated group of acclaimed soloists a wide audience is given the chance to experience great music in the historic setting of West Ham Parish Church.